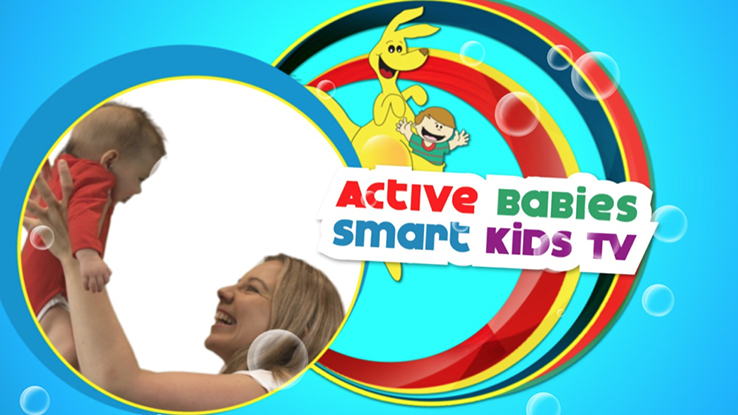 Hello and welcome to Active Babies Smart Kids TV, a series full of important information, exciting insights and lots of fun activities and ideas to help your babies brain and body development. Before you begin, please ensure you have read the following important information that will help you and your baby safely enjoy our series. We recommend that you find a time to do these activities when both you and baby are healthy, relaxed and happy. You and your baby will grow to love these activities. Try to fit some in each day. Babies learn best through repetition so you can enjoy your sessions over and over again. Do not do any activity you are uncomfortable doing. You could practice on a doll first. Mums, before you start doing any activities that involve moving and lifting your baby, it’s important to get the all clear from your doctor, especially if you have had a caesarian,. When lifting your baby, for your own safety, bend your knees not your back. Have a mat, lambs wool rug or other clean, safe surface for baby to lie on whilst doing Let’s do BabyROO with us. Learning must be fun! If your baby is not enjoying an activity, stop and come back to it another time. If your baby continually does not enjoy an activity we suggest you contact your local health care professional. Above all, remember that each child is both a gift and an individual. Rates of development will vary from child to child. BabyROO sessions include finger/hand plays, baby exercises, tummy time ideas, balance activities, dances to do with your baby, baby massage, action rhymes, activities to help their vision and hearing and much more. You will find more information on why these help your baby’s brain and body development as you watch each episode from the series. A cushion for your head. A happy relaxed baby and you. These exercises are movements that every parent can do, and a really lovely way to bond with your baby. When doing baby exercises, never stretch or force a limb to go further than it wants to go easily and start slowly, messages to the brain are absorbed better that way. Try a little massage first to help lessen resistance. Balance, or vestibular activities are any activities that gently rock, roll, tumble, slowly spin or tip your baby. These activities should always be done slowly and not for longer than 2 minutes. Spinning should go no faster than one 360 degree rotation every four seconds. Do not do vestibular activities if your baby is sick or has an ear infection. When it comes to clothing, we recommend fabrics that stretch and allow for lively, natural movement of your baby’s arms and legs. The more natural the fibre the better for baby. Natural fibres allow babies skin to breath. We recommend clothing made from pure wool and cotton. Babies in this series are mostly dressed in pure wool, or a wool/cotton blend. Bare feet are best for development, so when safely possible keep your rooms warm and your baby’s feet free of coverings. Balloons are a wonderful toy for your baby’s visual development as they are big, bright and slow moving. However, balloons should only be used under supervision. Never leave your baby alone with balloons. If the balloon deflates too far or pops, please ensure that all pieces are removed due to the risk of choking if your baby places it in their mouth. It is suggested that balloons not be fully inflated so risk of popping is reduced. When rolling your baby on a ball, be sure that the ball is strong enough to take your baby’s weight and that it is not on a slippery surface so the ball cannot slip out from under your baby. Hold your baby securely around the hips. Musical instruments can contain small parts. Only use musical instruments that are recommended and safe for children under 3 years. Never leave your baby alone with any toy. If they break or if small parts loosen please ensure that all pieces are removed and discarded. Ensure that all toys you use for any of the BabyROO activities are safe, clean and recommended for children under 3 years. Never leave your baby alone with any toy. If you are lying under the trees with your baby, as suggested in Episode 6 specialist interview, ensure that there is nothing that may fall onto your baby or yourself from the tree. Please ensure you have read the baby massage check list on the ActiveBabiesSmartKids website before you start any massage with your baby. Click here to read the baby massage check list. Thank you for inviting us to join with you and your baby on this exciting and wonderful journey of development. What happens in the first years of life not only matters, it matters a lot, so the gift you are giving your baby, is a great one.